Contact Magical Travel to take advantage of these fall offers AND receive a FREE $50 Disney® gift card when you book a qualifying Walt Disney World® vacation package. This offer is compliments of Magical Travel. Restrictions may apply. From festively themed entertainment to photo-worthy decor to sweet treats, it’s a phenomenal time of year to visit Walt Disney World® Resort. And staying in the middle of the magic makes it even easier for your family to become swept up in the spirit of the fall and holiday seasons. 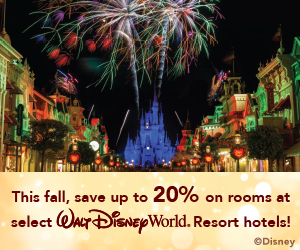 This special offer is valid for the Disney® Resort hotels listed here. View the chart to explore savings within each Resort Category. Experience the Disney® difference when staying at a Walt Disney World® Resort hotel. When you stay on property, you have access to amenities that will make your vacation memorable! Extra Magic Hours– enjoy extra time in one of the theme parks each day, either before it opens or after it closes. Disney’s Magical Express® Transportation- complimentary motorcoach transportation to and from Orlando International Airport and select Walt Disney World® Resort hotels. Resort Airline Check-in-collect your boarding pass and check your luggage from your hotel. 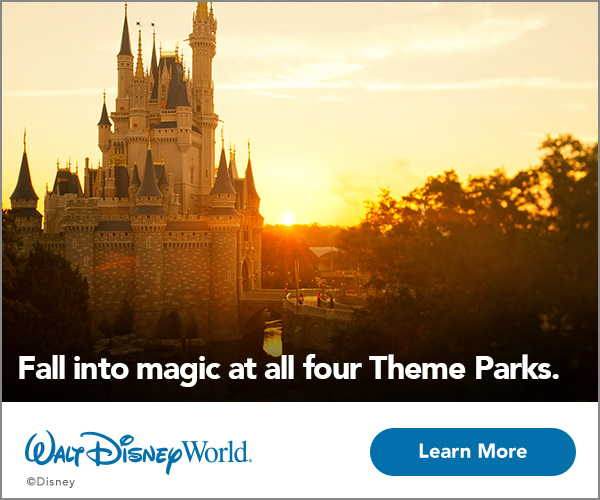 Express Checkout– enjoy automatic check out from your Walt Disney World® Resort hotel. Bus, Monorail, and Ferry Boat– enjoy complementary transportation to and from the parks. A family of 4 can enjoy a package that includes a 4-night stay in a standard room at a select Disney’s All-Star Resort and 4-day Magic Your Way base tickets for as low as $2,125. Sample package price is valid for stays most Sunday through Thursday nights October 8 through November 16 and November 24 through December 13 2018. Book through December 24, 2018. See the sample packages and offer details here. For as low as $1,053, a family of 3 can enjoy a package that includes a 3-night stay in a standard room at a Disney’s All-Star Resort hotel and 2-day Magic Your Way base tickets. Sample package price is valid for stays most Sunday through Thursday nights October 8 through November 16 and November 24 through December 13, 2018. Offer excludes the following room types: campsites, 3-bedroom villas, Villas at Disney’s Grand Floridian Resort & Spa, Cabins at Copper Creek Villas & Cabins at Disney’s Wilderness Lodge, The Little Mermaid Standard Rooms at Disney’s Art of Animation Resort and Bungalows at Disney’s Polynesian Villas & Bungalows.